The Cascadia Initiative data are open to the public. Data and metadata can be found at the IRIS, OBSIP and CIET sites. This page provides a number of useful links that will help users find and use the Cascadia Initiative data. 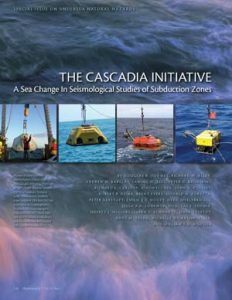 Ocean bottom seismometer (OBS) data from the Year 1 (2011-2012) and Year 2 (2012-2013) deployments of the Cascadia Initiative are now available at the IRIS DMC. Additional data from the Year 1 and Year 2 deployments will be uploaded as they become available. Data availability can be viewed at the IRIS DMC MetaData Aggregator. The following links to CI metadata are provided by OBSIP and CIET. Ocean bottom seismometers typically include a 3 component seismometer and a pressure gauge. In some instances, these channels are recorded at multiple sampling rates and some OBSs include additional channels, for example, hydrophones or accelerometers. For these reasons, a single OBS can often report more then 4 channels of data. Furthermore, for reasons of national security the OBS data are vetted by the U.S. Navy. The NSF and the U.S. Navy have signed a memorandum of agreement on ocean observing system security. Below we provide a description of recorded channels; the descriptions are separated out by OBS group. CIET Year 1 WHOI Data Description. Description of recorded channels. CIET Year 1 WHOI Clock Corrections. Table of clock corrections that have been applied to data at the IRIS DMC. CIET Year 1 LDEO Clock Corrections. Table of clock corrections that have been applied to data at the IRIS DMC. CIET Year 1 SIO Clock Corrections.. Table of clock corrections that have been applied to data at the IRIS DMC. Cruise reports from the 2011, 2012 and 2013 expeditions are available on the CIET web site and as metadata at the IRIS DMC. Cruise reports provide tables, plots and narratives of operations, which can be useful in evaluating data quality. Spreadsheet of stations deployed in Year 1 – 2011. Spreadsheet of stations deployed in Year 2 – 2012. Spreadsheet of stations deployed in Year 3 – 2013. Spreadsheet of stations planned for Year 4 – 2014.